Pilots at German airline Lufthansa are on strike again after a two-day break in their campaign of walkouts. The company cancelled 816 short-haul flights scheduled for Tuesday and 890 flights on Wednesday after pilots again extended their strike in an ongoing dispute over wages. 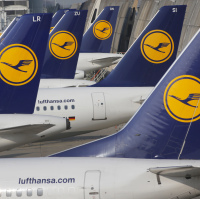 Lufthansa said some 82,000 passengers will be affected by Tuesday's walkout, and 98,000 by Wednesday's are affected. The industrial action by the Cockpit union is to be followed on Wednesday by a strike hitting both short-haul and long-haul services. There were four consecutive days of walkouts last week. The airline failed to persuade a Munich court to issue an injunction blocking the latest strike. The union, which has 9,600 members, says it "regrets the impact on the passengers, cabin crew and ground staff".